Guided by an app, strangers are invited to come alone to a certain place at a specified time. If you accept the appointment you may meet someone else whose identity you have no way of knowing. A blind date, if you will. If you commit to Something Bigger, the use of this time may take an unexpected turn. You may meet no one, or you may meet the person who has arranged the meeting. Are you willing to devote a part of your day today to the pursuit of Something Bigger? After touring their first show Landline, an experience for two audience members at a time, nationally and internationally for five years, collaborators Dustin Harvey and Adrienne Wong create Something Bigger. 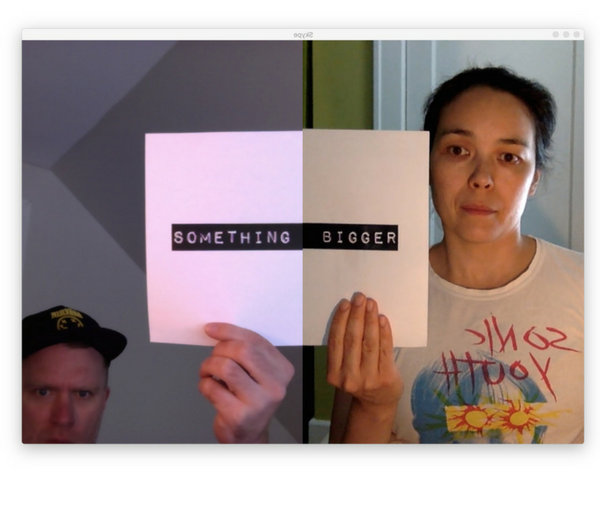 With this project the artists are extending the playful connections and magically serendipitous moments of Landline to a larger group of players/spectators. Together we track absence, imagination, and our collective desire to understand our lives as part of something bigger. Developed with support from ArtsNS. Residency period provided by Chapter Arts Centre in Cardiff, Wales. foldA is rooted in iterative design. Your feedback can play a role it what this work will become. Each form is unique to questions foldA creators are investigating.